THANK YOU A, for working so hard and sending us kids your special rice cakes, made with all the love in the whole wide world! They were SOOOO YUMMY! It made Bedo really happy too, that his mom made my party so special...I was King for a Day and all the kids have been sooooo good to me! Everyone decided they wanted to learn to play Frisbees so I have been very busy (between eating all the yummy exotic fruits and dried liver treats and chicken soup and rice cakes of course)...teaching them how to catch them in the air! I even have a little trick of tossing the Frisbee up in the air and catching it - great way to play the game, too! Thank you for letting me know how much it meant to mom, to have Clementine for petting and hugging yesterday...yes, me and Bedo had a plan to touch moms hearts and the little fly too, was a sign for you from Bedo and a gift of our love. I think Bedo knows you 'got' his little message but I will let him know too, and we will be thinking up more ways to let our moms know we are still very creative as we find ways to express our love from heaven. Thank you Auntie, for being such a good friend to mom and for adopting me as your bubbly nephew and for all of your compliments to me (I love to be called Handsome!) and thanks too for reminding me how proud mom is of her boy I will always be her Big Bubbly Buddy Boy. It's true I never wanted to let go when it came to games like sticks or Frisbees...there was one man Merrill, he tried to teach me to 'release' and I did it OK, when it came to letting the Frisbee go for him and I knew that's what he wanted me to do, but I always like playing keep away and playing the Tug Game the best...it's just a lot more fun! I found a little Frisbee for Bedo and the smaller kids to play with...it is made of strong cloth and it is easier on their teeth...he likes it a lot! Lots of warm hugs, kisses and tummy scratches to you my bubbly nephew! I will let Bedo know you are doing a little better...he wants you to be hopeful and have comfort and come away from suffering, but he and me, we both know it will take moms some time and we will just keep letting you know we are never far...always in your hearts and you in ours. Love you, Auntie Bedomom - thank you so much for all my hugs, kisses and tummy scratches! Please give my little cousins lots of affection and let them know the B Boys are watching! Wanted to reach out to you my sweet boy...hope you had a nice day at the Bridge with all of your playmates. Mom went to Ottawa today - had to go to the dentist and then had a nice dinner with Aunt Gracie...honey, she and Myles miss you very much. Myles was smelling mom, trying to figure out where you were and I didn't have the heart to tell him you had left for the Bridge...usually you'd make yourself right at home and head on over to his water bowl and promptly empty it...yup, that's my boy! Myles is so cute doing his little spin the way he always does before going out the side door...I know he would love having you there with him to bark at the people walking down the street...you two made such a racket...poor Grace. Anyway Buds, mom better stop bellyaching and see about getting to bed soon. Just wanted to let you know that you are always in mom's heart...you are always in her thoughts not even gone for a whole minute and sometimes it just hurts without you right here, but as you know this is a huge adjustment period or something, that mom was hoping wouldn't be happening anytime soon for us so mom is feeling robbed and sorry that we didn't spend more time together the past couple of years. We did spend a lot of time I know, but it was never quite enough for either one of us, was it baby? A knows mom misses you very much, a trip to Ottawa must be tough for her, with the thought of you every second, A also knows that she had find some comfort...Bubbly boy, life is so hard when things are not the same...the adaptation is just too challenging for us, A had been growing up in different countries, learning new languages, culture, environment etc but they are nothing compare to the adaptation of not having Bedo around, mom feels the same about you too, baby, please send us some strength, with the cold winter approaching makes this time of the year much more difficult for us. Today is Beed Beed's 7 weeks, 49th day, a day in A's culture it believes that Beed may visit A and A hope so too, if that sneaky little guy has any idea, please go with him to see mom in her dream, mom is longing for a big hug from your angel wings! Bubbly Boy, please come home to warm up the house! it misses you too, it is always your sweet home. A is very flaterred the way mom thinks about A, actually A is a straight forward person, and sometimes A may not say things that smooth, but they really come from A's heart...A just like to see people are ok. A hope to turn the pain of missing you guys into some sort of pride, for being loved, being able to give unconditional love...the pride that keeps us going! Hugs to your sweet mom and tons of hugs, kisses and tummy scratches to you, little B and all the Angels! Where my mom lives now, it was my forever home and she got it especially for me to enjoy with her, and I know she is sad that I had to take my earthly leave so soon, not even being there for quite a full year with her. But she knows I am still around - running in the woods, jumping for my sticks and watching out for her...she is almost done with the wood now, good thing because there will be snow on the ground soon...winter was always my favorite season! Love you so much Auntie B, Bedo and me are watching over you and we send you tons of heaven hugs - thank you so much for all of your sweet affections and tummy scratches...you know how much we love those! Everybody loves your cooking by the way - you sure have a great way with food! Thank you - I know you know so well, how it feels to go to those shared places alone, without your Lee Lee. Thank you for the lovely compliment - when I feel completely lost and disconnected, I try and think of Bud's touching mom with his angel wing...I do think they have a way of doing that and as you say, we sure could use it! I just had to write back and tell you...as I was reading your reply about "angel wings" - I felt my Baby Doll - she was right here with me! Such a sweet, sweet presence - I can't hold back the tears.....She's with your Buddy and she heard his encouragement to give me a "touch of love"!!!! Special kisses for you Buddy - Thank you! Glad to hear that Little B has been passing some of his sneaky streak to you, remember the love principle my boy, receive and return, you have to teach little B to be generous and friendly, pass some of your shining personalities to him...as being short-legged and tiny, he thinks his brain is so big. We two leggeds engage in a learning process everyday, and so are your angels, together, we strive to find our wisdom! Mom and auntie know you and little B are always around and this is a very comforting. Bubbly Boy, you need to remind mom that you and her bond is very spiritual and it is a forever bond, nothing is going to change that. You came to mom as a gift from God and He had led you to Mom, together you both had have so many magical momments that defined the meaning of love in life. Having this touching thought, it would make mom's life more fullfilled despite of the pain of missing you...Auntie is sure that she would redo the whole process gain in a blink! A knows that the mourning, the pain are the reminders to us about love and we are grateful for having you came to our lives...Buddy Boy, if you see Ellie please tell her to send some blessing Signs to her mom MeAndTheGirlies as she is mourning for her very hard! A asks you for this mission because you are a big Chief up there, yes A is being silly again and it is just her nature and she hopes she does not get into trouble for that! Hugs to you and sweet mom my boy, Auntie loves you so much my Bubbly Nephew, there must be the good old spritual connection between us! Thank you so much for your sweet letter to me! I always love reading them! You know, we never really knew how to read until coming here to heaven, that is one of God's gifts to us furbabies, being able to read our mom's and dad's earthly letters! You are so right A, me and little B are always around...please never doubt it for a minute as our spiritual bonds with our moms and aunties are forever bonds and it's true that nothing could ever change that! Me too, as you know I like to always hog my Frisbee's but I am learning better now, how to share and take turns...mom spoiled me so much and always let me have my way with the Frisbee's but I am doing better, and part of me will always want to win the game but I don't have to, every time! Hugs and kisses sweet A, Bedo sends lots to mom from Cloud Nine...he is cloud hopping a little bit today, he might be over on Cloud Ten right now...I'll try and go catch up with him now! I wanted to let you know that I visited the Golden Rescue site and read your story of angel Buddy - such sweet words for your Sweetness - truly a fitting name... They are doing a wonderful work for these precious babies - Buddy was blessed to have found you for his Mommy and you were blessed to have him. Thank you so much, for visiting the Golden Rescue site and for taking the time to read Buddy's story. I love this organization - they are amazing, and they care so much about the pups they help find forever homes for. They have a thorough process for making sure that the adoption is right for everyone involved, which is great. I looked into volunteering as a foster mom for them, but cannot due to the fact that the dog would not be able to leave the province, and I travel back and forth too frequently to the states. I know Buds would love for me to adopt another of his brothers or sisters in need of a second chance - hopefully one day, that will be possible. Thinking of you - hope you are feeling your sweet angel close tonight - thank you for checking in, it means so much. Thank you for your comforting words, A really appreciate what you are doing Bud, it is so comforting to know that you guys are healthy, happy and behaving up there...you are doing a great job as a chief..yes up there, all you kids are happy...it is a joy for A to know that All of you kids, little kitties, handsome kitties, pretty kitties like Patches and Ellie, big boys like you and Marsh, shorties like Bedo, Koji and dallas....all with different culture background, even the kids that had never have an earth mom/dad to call homes...are all together as ONE BIG FAMILY doing every little things in harmony...baby, would that be nice if we have such a life on earth? we are keeping going forward and forgetting the love principle behind, a very simple and a very orignal plan of god...why could that be burried under all other unecessary things of our lives...we two leggeds are so so loss! A knows for sure that all of our moms and dads from this site are ok, may be we all have the privilege of encountering the unconditional love...having all of your sweet babies' guidance, A can tell by talking to all the wonderful people from this website who speak the same language as A and mom, a language of love. Baby, how are you and little B getting along is so great, you two apposite boys blending together in such harmony that is so sweet...you big boy is getting a bit sneaky and little B is getting much more friendly...Buddy Boy, please use the sneakiness to send blessings to mom during this comming holidays...I know it is going to be hard A knows, mom misses you so much baby! she has such a big heart, A is occupied with all the little ones and A can not be so involved....A just do whatever A can to do good things to remember little B...from A's experience, when A is in pain or unhappy, it is nice to do good things to mend your broken heart. It must be fun to play to cloud hopping game, mom is so immaginative too...imagine you little kids in all forms with your heavenly pretty and handsome faces, hopping around above..so sweet so cute...and A will try to picture you all during the Christmas Holiday...yes, A see Big Bubby Boy's handsome face, see Beed Beed's big eyes, see sweet Patches cutest face, see Lee Lee's classical look, see Koji's sneakiest streak, see miss Dallas star look, see the Handsome prince, see Ellie and Beatrice's oriental faces with their cutest short nose, Sweet Harry, Bailey, Marley, Max, Marsh, Woo, Gerry....so Many Many that A can not remember but A loves you all, you All are Angels that have been sent to our mom's and dads and we want to use this American Thanksgiving Holiday to Thank you You All Angels for given us the Meaning of love! A personally thank you my Big Bubbly Boy and her Sweet mom for helping A and little B during these difficult times...A know that there is no complete healing but together we will work together...A need your angels wings as A know for sure no matter how sad A is, when think of my two B Boys, A feel peace and A's two little A too, A know they are in good hand. Hugs to you Sweet Boy and you Sweet Moms, Tons of Kisses and Tummy Scratches to you and All Angels A promises will send you tons of goodies for Thanksgiving, A will be an American for that Day so you all can have a big Feast! After all we are world wide family. I just saw your latest photos of Buddy - you have some precious memories there - what a loving boy - I can tell he was everyone's best friend..... My favorite is the super close-up of just his beautiful face (sorry Buddy - Handsome face) - I wanted to stroke his ears back - I know you miss him so much Elise - this is all just such a nightmare. Elise, I hope you are feeling your sweet Buddy beside you and your heart is warmed by his eternal love for you. You are such a blessing to so many people here (definitely for me) with your wonderful support and sweet words of comfort. Mom and me are so happy that you and Bedo and of course the Double AA girls and all earthly of Bedo's children are dual citizens now, celebrating American Thanksgiving with us, too! Mom and me, we have been dual for quite a long time...me I was born in Canada but mom was born a Yankee, so she is a Canadian transplant but now officially dual! Actually, we are all Heaven Citizens, belonging to no one country, so that we can enjoy all of the many cultures and rich traditions! As for little B, his sneaky little loving way of leaving you that shiny penny sign...he loved that you noticed it, but he was not surprised that you felt and knew in your heart that it came from him...it made him happy! Auntie, Bedo, me Big B, and all of us kids are watching over you especially right now, we know you have these earthly challenges with the man who has lost his heart and does not know where to find it. We want you to know we have wrapped you in one of our special clouds of protection Auntie, lined with love from all of us babies that you love so much! No one can hurt you inside our cloud of love A, because our love conquers all, and although it may seem like the bad forces are winning sometimes, it is only a temporary victory at best, for love, justice and compassion will be victorious when all is said and done. So please take heart Auntie, that we are standing strong with you, you can lean on all of us babies for strength, and lean on our moms and dads, too, because they love you very much and they want to make sure you are always OK...so you are never ever alone, OK Auntie? It makes our hearts so happy that you, mom and all of the other sweet special moms and dads love us furbabies so much! We are not only full of food...we are full of love, too! Please sleep well tonight, dear A...our big gang, we are with you always! Bedo sends his love and hugs, the Double AA girls, me and all the kids, we are all sending you big hugs and a sweet peaceful dream. Please give our hugs to my little earthly cousins Auntie, thank you for everything you do for mom and for all of the moms and dads you are touching with your special gifts! Thank you for your appreciation of all of us A, it means so much!! I was thinking of you, your sweet angel girl, and other dear friends here, who have made my journey with this horrible loss possible to bear. I honestly do not know where I would be, without the loving support of kind souls like you. Here you are, torn to bits yourself and yet, you reach out and touch so many with your loving spirit and bottomless kindness. Yes, that was a touching story about Rupee, the mountain climbing pup and the wonderful woman who rescued him! I love it, when stories such as this get the publicity they deserve. Rescuing animals in need is such an important cause, and anything that can be done to raise awareness around this , and other important causes such as stopping the puppy mills, is vitally important. It would be wonderful to find loving homes for all of them, wouldn't it? I do want to rescue another pup one day, but am just not ready yet, but I know it is Bud's wish and mine, too...to help another loving little soul have a second chance in life, and a forever home. I would love to adopt more than one, as it is nice when they have each other for company. A just love the Special Clouds of Protections, and A is very privileged to have this special streatment from you kids! So Touching! Baby, may be this is why A found 3 Lucky pennies at the very same spot this morning, and a couple paces more, A found another 2...what is going in on? Are you kids sending A a very special message that All Of You Loving Angels are with A at this difficult time! Thank you all of my Sweet Angel Babies, it is not just little B any more, it is All of You! this infectious love is so powerful and profound how can A thank you enough for your sweet mom and you my Soothing Sweetness! A is so happy to know all the real people from this wondeful website, these loving people are part of A's family now. Soothing Sweetness, not just Two Thanksgivings, but there will be Christmas Dinners in Chinese and Western Styles, August Moon Festival, and Chinese New Year too...you can name all the special occasions and your kids can have all the celebration in harmony from the above! A will hounour you all with loving thoughts and loving foods, see you got your heart and you tummy filled with the right ingredients, how wonderful can that be? Yes A's life is a bit challenging, Baby, A just loves you phrase 'A man who has lost his heart and does not know where to find it"...Yes baby, A has won as A still has A's heart, it can only get bigger everyday despite of what A is going thru...that's why A wanted to forget the fight, but that little Sneaky B may wants A to continue for justice's sake...Sweetness, little B is very sharp, he sees things when A was being blind folded. A know he will be with A forever with his sweet spirits to guide A as he knows A is so sloppy and trust people easily..and knowing You All Angels are with A is the greatest comfort. Yes you are so right, the bad ones are only winning temporarily, in the end, everything will come to light. We all will be at a place calls Heaven, our terminal station. Whatever comes through out the pace of life is just to portray who we are, a test of God! The sweet kind ones will resonates goodness beyond heaven, the bad ones are never reach Cloud 1 and would have left bad examples for earth to look down upon, to step over, that's what defines winning! Understanding this fact, A feels peaceful and blessed. Baby it is only money, we can always generate this materiality (just for consumption) not to be kept, it is the heart that is to be kept. That little sneaky B wants A to fight then A just let nature takes its own course and pace. A does not want to fight with a grinding teeth and an angry heart, A will just take a step at a time from the bottom of A's heart, there is much more saddness in seeing a friend who has lost his heart than the loss of materiality! A just want you to know that A is so thankful for you and mom, she has such a big heart and A wants to wish her all the love and happiness in the world, with good health too she deserve all this. A know for sure with her big heart, she will have no problem finding happiness, not to mention having you Soothing Sweetness by her side, guiding her and blessing her all the way. Love you so much my Soothing Sweetness, Hugs to your sweet Big Hearted Mom, lots of kisses and tummy scratches to all of my Angels up above and A thank you for all the lucky Pennies you kids sent me! I just looked through your sweetness's pictures again, I think there are some new ones. I love the Dogula one!! I watched your video on FB of Buddy and his Frisbee (I sent you a friend request) Him loved that Frisbee! What a sweet face .... I loved his fluffy tail always wagging. He's such a smart guy keeping both of those Frisbees himself. They are amazing aren't they? I almost cried watching his video, I know how much you love him and miss him... I'm so sorry Elise. All of our babies were so very lucky to have us such loving Mommies. Now its just so sad we miss them all so much. Oh honey, mommy is sad today...another Sunday honey, without you right here with mom. This makes 10 weeks by the calendar baby, that you went to God and the beautiful Bridge, and mommy is just missing you right now so very much! Mom is thinking about all of our sweet hugs, how you would always be so happy to see mom when she came back from being out, how you would get so excited to go for a walk and do your little circle spin, chasing your tail and then grabbing onto your back leg, baby! Jamie, Patches mommy mentioned about your fluffy tail that was always wagging. That was you, wasn't it baby? Always expressing so much happiness, through that beautiful tail of yours...mom would call it your golden plume! You loved your tail so much, honey...it was a form of entertainment for you and you were so proud of it, mommy knows! You had so much fun chasing it, when you got excited. And oh, how you hated it, if any burrs got into it and your sweet tail fur got tangled up from running through the woods. You would pull out the burrs yourself for awhile, and then mom would finish by combing out the rest with the brush...always had to be gentle with your tail honey, as you never liked your sensitive tail combed...it was your least favorite part to be groomed...your tail, and your hind quarters too, mom had to be very gentle and patient or you would get up and move to another spot! Mom remembers how you hated going to the groomer's baby. Mom would drop you off at this place in Ottawa, and you never wanted mom to leave you and you got anxious and tried to follow mom, but you were always so happy once your appointment was done and you saw mom had come back to get you...you looked and felt so beautiful baby, they did such a good job with you! Mom tried hard to keep you out of any puddles after that, at least for a little while! Mom has to get ready for church now, baby. Just wanted you to know that mom is thinking of you today, like she does every day and she knows you are up there with the big gang, and making mom very proud and being a wonderful nephew to Auntie Bedomom, she needs your Soothing Sweetness so much right now, baby...thank you for looking after her, and for being the Big Chief and reminding all the other kids to look after their moms and dads, too. Hugs, kisses and lots of belly rubs Buds - thank you for looking after the other angel babies up there...your big gang is growing! Joelee and Buddy Happy Moments! Thanks - yes, that one of Buds in his Dogula costume was pretty cute! There was a hat that came with that costume, but I could never get him to wear it...he had his limits! It's so sweet you were near to tears watching one of his videos - like you with your girl, I miss him beyond words. Still can't believe this happened, it just doesn't seem possible. I just want to touch him, squeeze his saggy sweet lips...just loved doing that, and so many other things like his belly rubs, sweet kisses and hugs. He was my 'connector boy'...just loved to connect with everyone and with life itself. Thank you so much for thinking of us - you and Sweet Patches are always close in my thoughts and prayers. Thank you for wishing me a happy 2 month bridge day! We kids had lots of fun, and probably too much food and Frisbee! Please don't ever worry about missing any special days, we kids are very busy and we just love it when you do get a chance to drop in and say hi! Thank you for thinking of mom, it really means a lot to her. Max says hi and he is showing me a few new tricks with the soft frisbees...he is very fast and I have a hard time keeping up with him! Soothing Sweetness has such a face, so gentle, so kind and so loving that A is so sure that even if A were to pinch you, you would not get mad at A.! Beautiful and Handsome Cousins posting such lovely and warm pictures, they represent unconditional love that warm everyone heart on these cold winter days...Soothing Sweetness, Mom will treasure all the pictures and this is how Sweetness looks Always, healthy. kind, loving and handsome. It is ok, we have up and down days, we fall and we rise, when we are hurting is when we are being truthful to ourselves and our angels need our feelings to be heard. Yes maybe when you are most vunerable, you need Buddy to give you a bit more love, even in his sweet spirit which I know he will, and you sweet Auntie with a Big Heart will have lots of more love from Little B, AA girls, Lee Lee, Max, Patches, Dallas, Beatrice, Ellie, Elizabeth, Rufus,...and all the Angels that I can not name all...These sweet angels will also reserve a special Cloud Area that is filled with lots of Love for Auntie Buddy's mom as they know you deserve it! Hugs and good night, Lots of kisses to you Big Bubbly Boy! love love your pictutures, You are such a photogenic Guy, tell mom that Auntie knows Bedo looks good in bright colors as he has "pure White Skin"! I love all the pics with Bud and JoeLee. I bet she misses him too. He is certainly adorable and looks very "snuggleable"
I know how much you miss your Bud. Believe me. I know and feel every bit of heartache and pain very well. For me today was exceptionally hard, funny how they come and go? That's what I meant by the roller coaster effect. Coming here does make it easier. I have loved getting to know all of you sweet Mommies. I love looking through all of the pictures of your babies, Seeing their faces, seeing how loved they were, how happy they were, how lucky they were. Imaging all of those happy special times you all had together. Such precious memories. My mom loves the name "Soothing Sweetness" - she told me in a prayer last night that this is just the right name for me, her baby boy. We kids are nurturing your Special Cloud of Protection, and we are adding in other ingredients, making this a Healing of Heart Cloud too! The Big Chief and Little Indian, we are engaging the other kids too in our big gang, Double AA girls, Lee Lee, Patches, Max, Rufus, Sissy, Bailey, Kodiak and Bailee, Ellie, Ms. Dallas, our special bunny Christoph, ...we have so many now, I will have to take turns naming everyone! But we kids are not only playing up here and eating and having fun, we are doing our good works in the world, too, especially comforting hurting moms and dads and making sure they are all OK.
You know A, the special pennies you found hold many deep meanings, and one very true one is as you felt with your own Sweet Heart, that you have ALL of your Angels loving, soothing and protecting you within the Cloud! A you are so right, your heart just gets bigger and bigger every day, and your earthly struggle with the sad lost man, will come to a conclusion, it is a temporary trial and as you say, we are all given our little tests from God, to help us grow and become stronger and more wise. I know Little B wants very much for mom to win in the struggle and all of us kids are rooting for you and for true justice, but as you already know, you have won the most important aspect, already! And no one can ever take that from you A, it is yours forever and the money and material part is just a passing thing, a big help in earthly life but never the most important. All you can do is take pity on the man with lost heart...as you know the truth, the saddest thing is knowing someone is lost inside, plus confused about what is really important. All Auntie can do for him is lead by good example, pray for him and feel compassion and forgiveness. Auntie, your health is very important and it is good, you are taking one step at a time. We kids are happy that as you go through this time, you are not caught up in the anger or grinding of teeth part. Sometimes very hard to let go of harsh feelings we know it is hard for two leggeds because life is so much more complicated, but this is why you have all of your Angel Kids here to help! This is why we are all your Soothing Sweetnesses, never forget that our love outshines and takes away any darkness, when you feel down please think of us, think of yourself Sweet A, in the center of the Soft Cloud and all of us babies shining faces in a circle directing love for healing and comfort. My mom a lot like you A, she trusts people too easily, gives them all great benefit of the doubt and she has been hurt because of that, she could have used Little B's wisdom and started looking with eyes open instead of blindfolded, like you say. We kids have a great sense of people and situations that most two leggeds do not understand or realize...and even smart little ones like Bedo, are more in tune and less trusting than some like me. Like mom, sometimes I trusted too much, too but it is because my Nature a little different from Little B's...me a big sloppy boy sometimes and get carried away with Love and forget to watch for signs, but Little B is a good teacher, we all know how smart our Little Indian is! Thank you so much A, for reminding mom that her Soothing Sweetness is always close by. She has had so much help from the caring loving people here, our new family and mom too, is very thankful for all of the love and support. Auntie, Bedo is also blessing you in so many ways...he knows how much you want to order the special medicines, that you would spend any amount of money to make him well but he just has to remind you, that he is in perfect health now, and he knows you miss doing the little things for him that my mom misses doing for me, too...but it is all temporary because as you say, Heaven is our eternal place and we are all going to be there together! Auntie, I am so thankful for your support of my mom, and for supporting hurting parents like Jamie, Melanie, Pamela, Barb, Deb, Mihaela, Stephanie, maxsMomandDad, and so many more as our gang continues to grow. We just want them to know that our tummies and hearts really are filled with all of the right things, we are all safe and happy and we are all very close, never far from any of you...we are working in teams now and Little B is helping me organize...it is so much fun! Thank you for all of our hugs and tummy rubs - we kids live for affection Auntie. Please give lots of hugs and tummy scratches to your earth babies from me and Bedo! Love you so much Auntie, thank you for all that you do, for your beautiful thoughts and expressions. All of us kids sending lots of heaven hugs to keep you warm and snuggled in this cold weather! Your Big B Bubbly Boy Buddy, Soothing Sweetness! Thank you so much for looking at the pictures - Joelee does miss him so very much. She says very little, but I know her heart is broken. I have a couple of pictures of her, taken in August of 2007, when we first got Buddy. It was the first time she met him and it was truly one of the happiest moments of her life, knowing she had a new 'pup cousin' in the family to love! It's so true, how we treasure so much our pictures now...wish that I had taken thousands more...could never get enough of his sweet face! I remember you telling about going to Wal-Mart, and how impossible to go there, hurting so much to even think of it...as you say, we rise and we fall on these crazy emotional waves. Thank goodness our babies write, letting us know that all is well, they are taking such good care of us, always close and thinking of all the moms plus the sweet little things they do...Bedo is the organizer, for sure. Thank you so much for listening, for loving all of our babies so deeply and completely - we are truly a bonded loving family now, where loneliness is just a mistaken idea, because now we all have each other, always. All of our babies are so photogenic and convey the love principle in their beautiful eyes and faces. It is the deepest blessing to get to know them all, and their sweet moms and dads, too. Ten weeks - I know it probably seems like both a lifetime and just yesterday since that day. I've wondered if we will always think of them on "that" particular day of the week (Fridays for me) of if there will come a time when it will be just another Sunday or another Friday - somehow, for me at least - I don't think there will ever be just another day. Joelee (I love her name) is a beautiful young lady - and her love for your Sweetness is so evident in those precious photos. I know she must miss her friend very much. You are right Elise - it is truly an honor and blessing to look at all these sweet angels and get to know them and those who loved them best. I am thinking of you my friend. Thank you for the compliment for my sweet niece Joelee...she is a beautiful gal, inside and out. Although 16 now, she still makes all of our birthday cards, Thanksgiving and Christmas cards by hand...she is very artistic and even as a little girl, she enjoyed drawing pictures and painting with water colors. Just this morning, I took a picture of her precious little Christmas poster that she made for Buds. She drew this as a present for him, for his first Christmas with us, December 2007. How I wish to wind the clock back to that 2007 Christmas. I was thinking of resizing this photo and uploading it to the site to include in a post, closer to Christmas. Having no children of my own, I have saved literally every scrap of artwork, piece of paper, card, note, gift that she ever made. 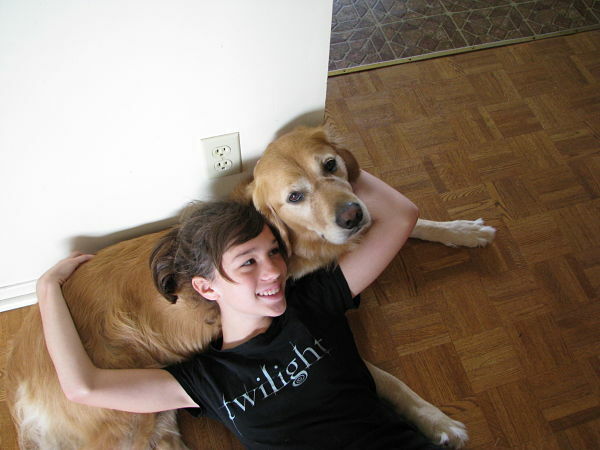 The last time she came to visit Bud in Canada at the house, although she turned 16, she was still down on the floor using his belly as a pillow, just like she always did! I love that she still has a bit of that little girl left in her...the time went so fast. 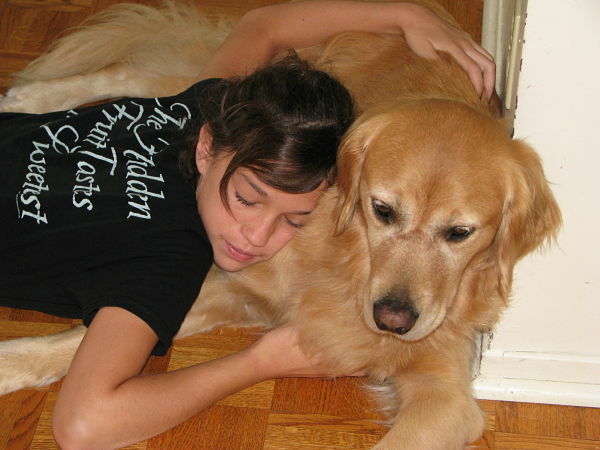 The other day, looking through more photos, I found some earlier ones of Buddy and her stuffed golden retriever that she named 'Baby Buddy'. She wanted to have a Buddy at home, too...to keep her company when Buddy wasn't there...so it's so cute how she arranged these poses of her 'Little Buddy' with my 'Big Buddy'...just too sweet! I look forward to posting more precious pictures into albums, as time goes on...it warms my heart truly, that you and so many other loving souls here, enjoy seeing them. You always write the nicest words to your sweetness. 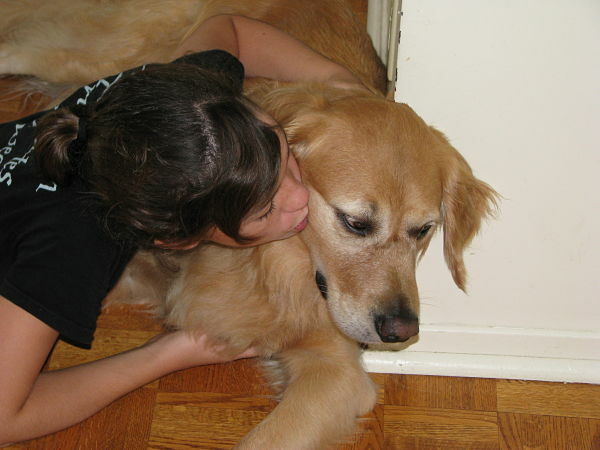 The pictures of Joe Lee were reminding of my niece Elsa ( she's 9) and her doggy Lily who is a golden. Lily is adorable but a bit of a "scardy cat" When my sister comes over she brings Lily and she is always scared of my cats ( Wow, I guess just Link now) that's sad. I forgot I told my niece sometime last month I would attend her 1st cheer competition tonight and I forgot. I didn't even remotely remember. My sister called to see how close I was? I drove those 9 miles and ran in as her team took the stage. I didn't want to go, be there, or smile and act happy. But I put my "fake face" on and cheered and clapped for her. When my niece saw me her eyes lit up and I felt so bad feeling that way. Her and I are very close, I don't have a daughter. She calls me Aunt Mamie because when she was little she couldn't say Jamie, so Mamie just stuck. I love it. If I ever figure out how to put a picture up on a thread on my own, without bothering poor sweet Ed, I'll show you Elsa & Lily. I know you are missing your sweetness Elise. I miss my girl so much more then I can convey in words. Wishing you sweet dreams tonight. Thank you so much for your compliment for my niece, Joelee. That's so sweet and adorable, that your niece Elsa calls you Aunt Mamie. Joelee called me Esa, instead of Elise because it was easier and even now, she calls me that, which I love. Elsa must just love her Lily to pieces. What I did, to put pictures into a post, was to first upload them to an album in my member's area. Then, I would right click on the image to copy it, and then come back to the post and paste it in, where I wanted it to appear. I hope that works, if you try it. I am sure Elsa would have understood, if you had missed her cheer competition, but it was so nice you were able to rise to her occasion, as it meant a lot to her that you came to support her. I had a physiotherapy appointment today, and my therapist realizes how depressed I am, and down. She is encouraging me to try and be at least a little bit social, so I am going to start a yoga class once per week, after New Year's, and possibly an aqua fitness class, just to get some social interaction. She told me that if we are out, or with people and even though we may not feel like smiling, or laughing a little bit...even if we have to fake it a bit, it is a healthy thing to do, and it's OK to be a little fake, under these circumstances. I guess some studies have been done on this and the affect on the brain or releasing endorphin's, etc...not sure exactly, but I know what she was trying to say, for the most part. Wishing you all the best Jamie - please take good care of yourself, and may you also have sweet dreams. I felt so bad when I pictured you going through Buddys things, caressing them all and looking at them with such sadness. Then crying... Breaks my heart for both of us because I know exactly how you're feeling. Its just horrible! I have a little makeshift nightstand right next to my bed. It has her little cedar box with her collar on top, the last towel she layed on from home and I took her to the vet in, Peaceful Paws brought it back to me, clippings of her precious white fur, pictures of her, and her sweet sweet paw prints. They made me 2, one they shaped like a heart. There are many things I dread: going to bed, waking up, coming home, looking at all her spots, seeing her empty water bowl, that sad empty towel in front of the fireplace, but the one thing I hate most and hurts me something horrible is walking down the long hallway to my bedroom door to where I see my bed... and its empty. Breaks my heart. Patches spent 90% of her time there. especially towards the end. Its heart wrenching to not see her all curled up there waiting for me, then stretching out and looking up at me with her sleepy eyes. I loved it when shed get up to fast she was so excited shed still be half asleep. I would scoop her up so tight and warm and rock and pet her til she'd "squeak purrbark" at me because she probably wanted food or to drink water from the faucet. It utterly rips my soul, I miss that so much. I used to do Yoga every single day before all "this". I loved it, its great for your mind and body. I know you'll love it too. Let me know. I'm going back very soon myself. My fear has been that Ill breakdown in the yoga room. So sad huh? Also I think its so cute that you have your nickname from your niece just like me. I'm going to try and put a picture up of my girls things by my bed.... Hope it works? How is my Big Chief Today, how is that handsome golden boy face? I can just immagine you running around taking on your duties as a big chief up there, surrounding by all the little angels doing their duties...A thinks the most important dutiy for each everyone of your is to watch out for us moms and dads down here, we all miss you very very much. The holiday is comming and we need to feel your sweet prescence in sprit to avoid the hole, a big hole for the very first time as so many of you have ran to the RB this year...Baby, as much A is hurting about little B, and feel that's it is time to pick things up, maybe by keeping busy, we will get by faster to the time when we meet again..A is glad that mom is taking yoga classes, it is a very good thing for the body and mind..A would love to do Yoga but A is too occupied with walking the babies and work..hopefully A would have enough exercise just by doing that. Bubbly Boy, sometimes A wish the two leggeds' life would be simple but it is not, A knows it is very hard to pass the earth time, it is hard to find the meaning of life..every since A was little, A has been trying to build something right, something normal but everything just crushed ...it is sad, just like when you has done good things but it turned out bad...A sure mom feels the same way too, we struggle to find the logic of it to the point that we are tired and nothing matters anymore...all it matters is the good intention and you always do things that come from the heart and you cant be loss. A feels sad to see so many moms and dads are suffering when you guys have left...it is so hard to get adjusted to, may you all angels give us strength to do that...we strive, we try but honestly it is hard, maybe we are lonely people or may be we are just too good for the society norm and we only rely on you for emotional support, when we think we loose it, we lost! After a few signs from Beed Beed, A is sure that you angels are still around with our moms and dads, having this believe A feels better...after all love is such a goodwill a very valuable kind of intangible asset. ; if we treasure it the value will just appreciate time after time. A wants mom to believe this too and to embrace this believe to give her strength to live a happy and healthy life no matter what abstacle she is facing..Watch out for her Big Boy, A knows little B is watching out for A, which is a real blessing, see how faithful you four legs are? you don't get much of that in human, at least from A's experience. Tons of kisses and tummy scratches to my two B Boys and Two A Girls, and all the Sweet Busy Angels Up there! You know, It's funny you mention a "time warp". I feel like Pet Loss is sort of an "alternate universe", if you will, for me - where Lee Lee is still "alive" to me and where I can speak freely about her and share some of my precious memories with wonderful people, like you, who really care. In my "real" life, I rarely mention her name out loud - I am fortunate to have a couple of close friends who "get it" and I am grateful for them - but to my family, she is just....gone.. Thank you so much Elise for your sweet words for my Lee Lee - it means so much to me that you look at her pictures and read her little stories. You are a such a blessing to me! Sometimes we kids up here, we are sad some, because we know you moms and dads are missing us on earth with you, so much. Sometimes we would love the chance just to go back on earth, even for one day to comfort you in the physical way we did when we were with you, and with God's power we could do that because there are miracles all the time and this would be an easy miracle. But then, when we would have to come back to RB because of our mission here, you would have to experience the pain of losing us all over again, which is why we have to stay put at the Bridge. But our sweet spirits are going out, all the time to be with you and help you. Please know that this is true! We will be trying very hard for moms and dads during holidays, for you to feel our presence, because we know that you are missing us so much. Please try to think of us as being with you in the special ways we were always with you all the time. Bedo loves that you talk to him...he hears you and me too, I hear my mom when she is talking to me in her special voice, and we also hear what is in our mom's hearts, too...every emotion is shared with us. We babies know it is hard, we know it is not the same for two legged's and that your lives are so much more complicated than they need to be. It is easier for us, because we have each other, and heaven is bliss, our only sad moment is for hurting moms and dads, but sweet A, the time is not the same here! We know that in the blink of an eye, you will be with us again! That is why we are only sad for your momentary sadness dear A, Beed Beed would give anything for you to have his forever love for you overtake your pain of missing him. Me too, with my mom and you wrote it true, sweet A, that me the Big Chief knows that my mom loves me more than anything...that she would have done anything to have me with her, but it was not the Plan, just like it wasn't for Beed Beed, his time for heaven came and now he is doing very well A, you would not believe how young he is now...think of him as his young self, because that is how he is now, no more cancer, no more old age...he is free and happy and smiling at you sweet A, his beautiful tail that you remember so well when he was walking with you...he is full of so much love for his sweet sweet mom! He remembers too, how you went on the Sky Train together, how he traveled to your work during those years in the bag...he will always treasure those earthly memories with his sweet mom! Sweet A, Beed Beed doesn't want you to worry or be hurt about the wild salmon in the fridge that was his special food. He wants me to tell you, it's OK and if you want to share it with the other kids that would be great because he doesn't want you to be hurt thinking about what to do with it. My mom has some of my special beef marrow bones in the freezer, and I want her to share them with Hank or Jack, my new friends on our road. Dear A, do you know how happy Bedo is, that his sweet mom is going to make good use of her hard work and knowledge for her career? Bedo is very proud of you, and me too! You honor him so much, by doing that and being strong and doing your specialized work, this is exactly what he wants for mom, and he will always be proud of mom for her hard work, and also because her heart is as big as the ocean, even bigger expanding out into the whole universe! Love is the energy that expands and never contracts, it always gives and never takes, we kids are wise you know...and yes, we four legged's are very devoted and loyal, we never abandon our duties to our sweet moms and dads, and it is never a chore for us, to send our sweet spirits to comfort you and be with you...it is what we live for! Well Sweet A, I must go now and see what the gang is up to, here on Cloud Nine...make sure everyone is organized and check with my little Chief, too...see what we will be planning for this week. Love you so much Dear A...please have a peaceful Sunday, your Double B Boys are sending you so many hugs, so do Double AA girls and the other sweet busy angels here at the beautiful RB! I am so sorry that your own family does not understand. I hope they can empathize with you, at least to some extent and understand why your heart isn't into celebrating the holidays this year. My own mom is an animal lover and she very much missed her cat Pecan, who was with her for 16 years...and she cried and grieved for her but she is such a practical person, and at 82, after having lost my dad and several of her friends, she has the view that she has to just keep going, no matter what. She still manages a library, working nearly 20 hours a week and has done so for nearly 28 years. She just accepts death, as part of life...she knows I am 'stuck' at the moment and is trying to have patience with me, and would love it if I could 'come around' for Christmas. She is a wonderful mom, she loved Buddy very much, when he came to visit, he was always so excited to see Gram and always had hugs for her! I know she misses him too, my whole family does but mom just doesn't know how to help me more, but I am fortunate that she does try, unlike so many here I am blessed, to have an understanding family. I know what you mean, about treasuring those precious moments even more...those 'ordinary' moments that came and went so easily and quickly. I know I treasured many of them but others, I just didn't pay close enough attention to while they were happening, which makes me sad. Dear Buddy and Elise, what a special message. And you're right - just when I needed a sign most. Buddy, find Felix & Oscar and make sure they are part of your special gang.